The observed problem is that students are unable to participate in active listening exercises, recall information, or stay on task due to attention deficits that are heightened due to stresses that exist outside of the classroom and this has a direct effect on their academic success. The problem may be related to the stress that is causing the students harm and impeding their learning. One known way to relieve stress and to focus the mind is the practice of meditation. The purpose of this study was not quieting students but rather bringing the entire mind to the task of learning. The intent of mindfulness practice is to calm the body and mind, make one aware of their surroundings, and help to focus the mind on certain ideas or activities. This study is particularly relevant when considering the need for meta-cognition in the practice of teaching and learning in the 21st Century classroom. 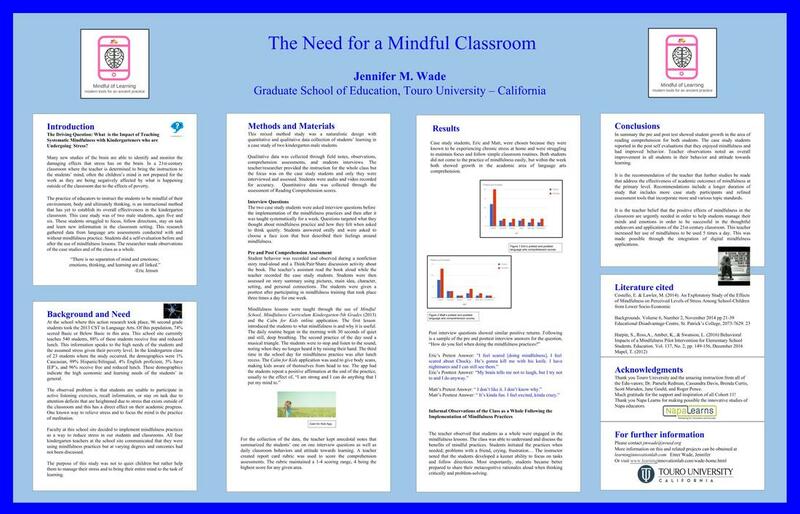 The goal of this study is to determine the effects of mindfulness training on students who need help to focus their minds while learning. In consideration of the negative effects of chronic stress as it is related to memory, focus, social interactions, and self-esteem, this study attempts to explore a tool, mindfulness, to aid in the reduction of that stress. To read the research paper click here. To view the research table click here. Click on the graphic to view the slide show presentation of this research work.